I don’t usually take a photo of what I eat for lunch, because it’s probably pretty pedestrian. A bowl of soup, a container from the freezer heated up, Burger King. The other day I was going through the freezer and I found some corndogs. Had a couple with Frenches mustard. They were ok. But today..oh man…my sandwich was totally photogenic. So out came the camera. In the recent past I got on this sun-dried tomato kick, especially sun-dried tomato tapenade. I regularly bought these little jars of sun-dried tomatoes in the produce department at Ralph’s market to use in my recipes. They were the best I had ever found. Then one day they were gone, replaced by jarred generic artichoke hearts. I was devastated. I looked all over the store, but they truly were gone. There were several other brands in different places in the store, so I bought four different ones to see if any would suffice. I was going to use the last jar today, so I opened it up, and lo and behold, it was a jar of roasted red peppers. Must have been adjacent. Well, they were red. I had to think fast for a way to use them and this recipe I’ve had for about twenty years came into my mind. I had all the ingredients, so I made it. Photographed it. And ate it. It was really good. Do NOT use jarred roasted red peppers for this recipe. If you do I’ll have to ban you from my website forever. Roast in the oven, grill or flame char, yes. Jar, no no no. Please. 2. Line a baking sheet with foil. Mix garlic with oil. Lightly brush baking sheet with some of the oil mixture. 3. Place half of the bread slices on prepared sheet. Place half of the cheese on bread slices. Top with roasted red peppers. Cover each with a generous amount of the shredded basil. 4. Top with remaining cheese and bread slices. Brush tops with garlic oil. 5. Bake sandwiches uncovered until bottoms are golden, about 8 to 10 minutes. Turn sandwiches over and brush with more of the oil, as needed. 6. Return to oven and bake until second sides are golden, 4 to 5 minutes. Cut in half with a serrated knife. Serve hot or room temperature. Or cut crosswise into 1-inch slices for an appetizer. This looks stunning…I mean really, I want one right now! You are such a talented photographer…and I just adore melted cheese sandwiches. Yum! Wow. If I had a sandwich that looked that gorgeous AND that edible (sounds amazing! ), I too would be taking photos, LOL. Another STUNNING recipe! I promise, I’ll roast my red peppers I can’t wait to try this! YUM! I don’t think I could have waited long enough to take a picture before scarfing this whole plate down. Those are some yummy looking sandwiches. 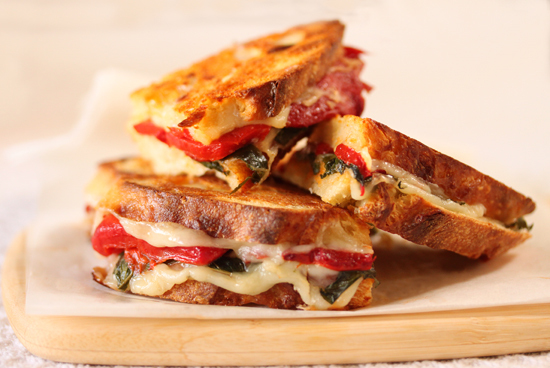 Think I’ll be roasting some red peppers this weekend…..
What a beautiful and yummy looking sandwich! I think roasting the peppers yourself is half the fun! I love standing over the stove with them on a skewer. It’s the only time I get to play with fire. That looks like one GOOD sandwich! Simple fresh flavors. And melted cheese. Can’t go wrong! Looks good mom, can I have some? Let’s make a deal…I will supply you with homegrown sun dried tomatoes if you promise to invite me over for lunch and make these sandwiches. My San Marzano’s are coming on strong, so it should be another good year. Gorgeous. The brilliant colors make this so appetizing. I love roasted red peppers in sandwiches. I make a breakfast version with the same ingredients adding eggs for protein. My Man’s Belly ~ Are you Kidding? Double deal! Beautiful colors! Looks so very appetizing – I love anything with sweet bell peppers. Loved the story! This sandwich looks fantastic. Isn’t it funny what amazing things we end up making without ever even planning to? hehe I’ve never roasted my own peppers before >< will try next time tho! the sandwich is definitely photogenic…hmmm provolone cheese! Lynne, I have prepared this sandwich for lunch and it was delicious! Thanks for the recipe!